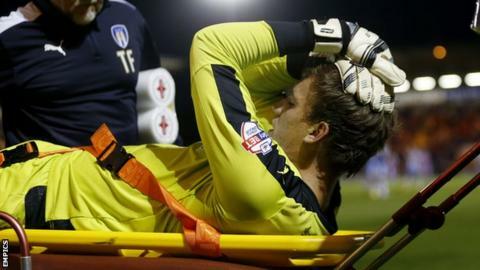 Colchester United goalkeeper Sam Walker could be out for the rest of the season after suffering suspected cruciate ligament damage. The 23-year-old, who sustained a knee injury last season, was carried off on a stretcher during Tuesday's 1-0 Capital One Cup defeat by Reading. Walker made 49 appearances for Colchester last term. "We managed (his knee) from the end of last season. Sam was very confident in getting through. "He started the game well and made some great saves but just one wrong movement and we think it's gone - we'll seek specialist advice on the prognosis. "Our priority is Sam, we've got to look after his welfare, make sure he gets the best possible treatment and get him back as soon as he can be."